Hello there. I'm guessing you stopped by for a bit of kit inspiration? You've come to the right place! This month over at Counterfeit Kit Club we are using the "Queen Mother" of all kit clubs as our inspiration. Yes, that's right! STUDIO CALICO. I have a confession to make. I want to like their kits. I've tried to like their kits. However, I don't always get all the fuss that is made over their kits. I certainly don't like them enough to have one come to my doorstep every month. Now, don't get me wrong...I have ordered from SC and enjoy many of their products. When I'm in a big box store or a local scrapbook store and see Studio Calico products, I take notice and even buy, but I guess I like to pick and choose my own supplies. I guess that's why I've never taken the plunge into the world of ANY kit club. So, that brings us to our inspiration this month, "Penny Arcade". This is just one of many options, so be sure to check out the link below. Strong pops of red are evident in my paper choices. Feathers and bold black fonts are an important part of the inspiration, so in go the bold black word stickers and the soft blue paper with the white feathers and red berries. A yellow crepe paper border was shown, so I included a yellow ombre crepe paper piece that I had been hoarding from a Dear Lizzy paper pad. Accents in gold and vellum mimic the gold and white polka dot paper. Map paper has become a staple in my stash these days and SC seems to agree. The bold Amy Tan Thicker words were a purchase I did make with this kit in mind. I don't usually do that, but thought they seemed so different. It will take careful placement to pull those off...wish me luck! See those Distress Inks? I used those as my color palette (which, of course, were derived from the papers) when choosing my embellies. Red cherry flair, STUDIO CALICO polaroid frames, and a little red Radio Flyer wagon (awwwww!) are just some of the goodies included in my tray. I'll let you study the rest to discover my other additions. Ok then...DARLING! It's time for you to finish the hop (Jemma is up next!) and then get working on your kit. Remember, we don't NEED fancy schmancy Studio Calico to build a kit for us - we can build one from our own fabulous stash that is completely unique! A Warm Welcome to our Guest Designer, Sherri! Remember to share your creations with us over on the August Mr. Linky. I was wondering what part of your house we would end up in this month.Your window boxes of geraniums are a fantastic backdrop for those pretty papers and embellies to die for. Have lots of fun using them. Gorgeous display of beauty and color :) Fabulous kit! I agree with you about the Hype I don't see it neither :) The thing that you said about the monthly kits coming to your door (light bulb moment) I used to get Dazzles monthly kits and they have just sit in the box I think I'll be pulling those out to see what's in there for a kit this month thanks for that! Oh, I love red geraniums. 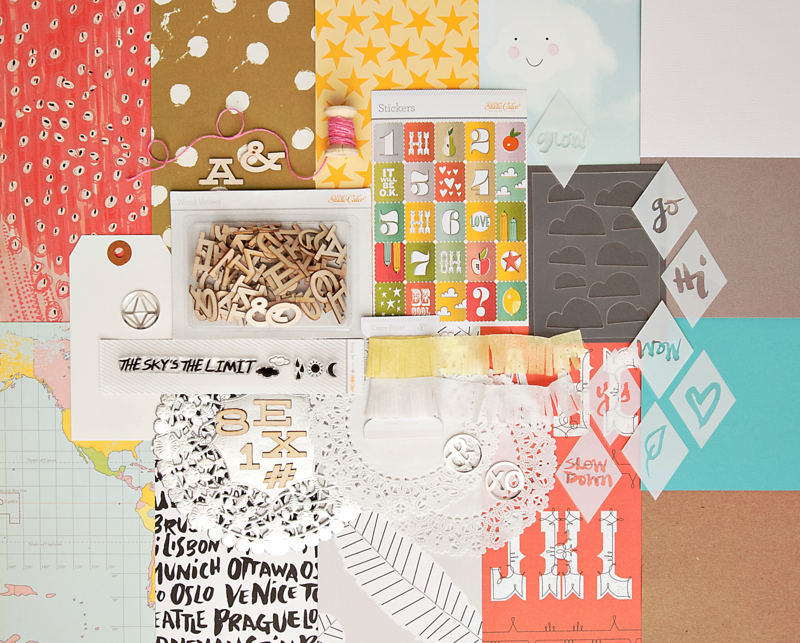 I recognize many of your supplies there - it should be a fun bunch of goodies to work with. oOOH I have to totally agree on what you say about buying kits and I would LOVE to have some of the ones about on the net... but on close inspection..... would I use all of it? Hmmmn....probably not, and yes, I would buy certain products in the said kits when I saw them in stores..... one of the reasons I LOVE ckc - theres nothing like a reason to shop ones own stash! 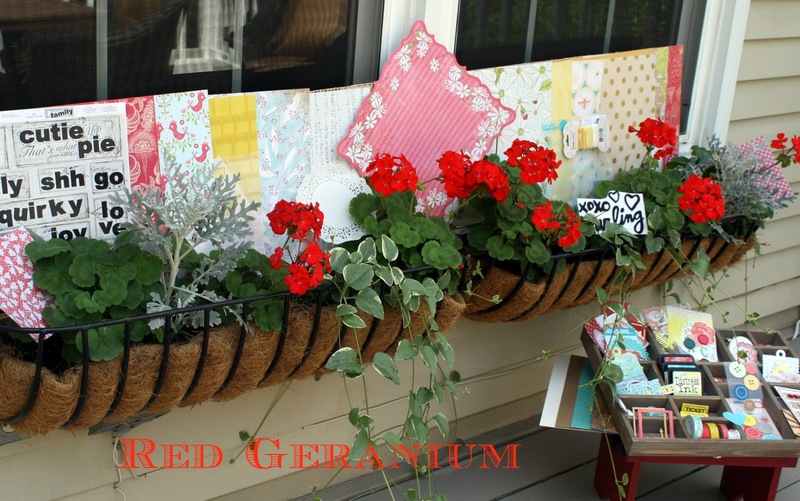 Love your papers in the window garden... and your embellies box is totally fabulous! Such a summery selection. The cloud washi tape it too sweet. And as always, your unique presentation does not disappoint. I can totally relate to what you wrote about SC kits. I, just like you, don't fall of my feets for their kits, though I do like many of their products. You've made a great kit and it is full of yummy products. enjoy creating with it! Beautiful kit! Love the red and yellow color combination. OH wow, I can't say which I enjoyed more . . .your lovely kit or how you've photographed it! Stunning display.. and good to see you haven't tried to do a faithful replica of the original. Go girl! I always love how you lay out your kit!